2 Varvarka Street, Moscow (tel. : +7 495 698-33-98), Metro station: "Kitay-Gorod". The Church of the Great Martyr Barbara, which lent its name to one of Moscow's oldest streets, was built on this site in 1514 by the Italian architect Aloisio the New to a commission from the rich "surozhane" (people who came from the merchant town of Surozh, now Sudak) Vasily Bobr, Fyodor Vepr and Yushka Urvikhvostov (it is thought that Yushka was a nickname of Ivan Bobrishchev). A chronicle refers to the site as "behind the marketplace, opposite the Pansky Court". Soon after it was built, this Church became very popular in Moscow. In the 16th century, not only the street was named after it, but also Kitay-Gorod's corner tower, St Barbara's Tower. Until the 16th century, Varvarka Street was called Vsekhsvyatskaya Street (All Saints Street), after the All Saints Church in the neighbourhood of Kulishki. The exterior appearance of Aloisio's white-stone Church may only be imagined based on the old master plan. The St. Barbara's Church had a square architectural plan, with semicircles protruding from all the four sides; it may have been similar to the Church of Metropolitan Peter at the St. Peter's High Monastery. In 1795, the Moscow metropolitan Plato ordered the disassembling of the old building of the Church, which at that time was still "strong and fully equipped", because, in his opinion, it did not correspond to the general appearance of the area. 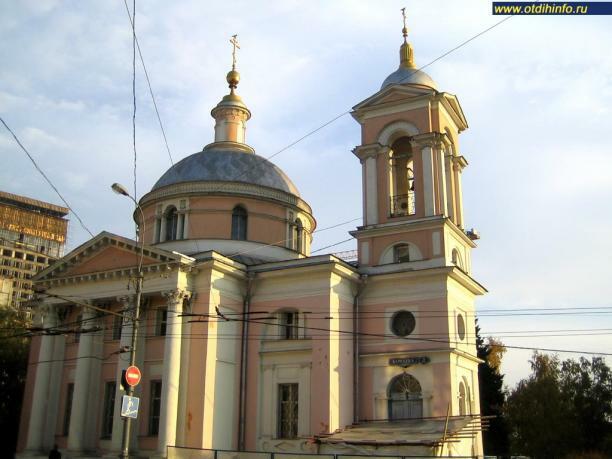 The new Church was constructed from 1796 to 1804 to a design by Rodion Kazakov, on the Aloisio's foundation. The money for the construction was allocated by Ivan Baryshnikov, a major of artillery, and by Nikolay Samgin, a Moscow first-guild merchant. The Church was consecrated on 26 June 1804. Its main part has a cross architectural plan and features porticoes with their pediments based on Corinthian columns. Inside, the Church is full of light, thanks to its two layers of windows and the small daylight windows of its dome's drum. With its exterior decor featuring clear lines of the entire main part and with its wide round dome featuring a small spire, this Church is a good example of mature Moscow Classicism. In 1812, Napoleon's troops used the Church as a stable. The building suffered a lot of damage. It was restored in the 1820s. The Church's bell tower is not so tall and is crowned by a small semicircle with a cross. The upper tier of its belfry has wide archways framed with pilasters featuring a Corinthian capital and pediments. Its second tier was demolished after the 1917 Russian Revolution, later being rebuilt in 1967 during restoration works (supervised by the architect G. Makarov). Inside the Church, 19th-century painting and choir stalls in its western part have survived. As was the case with many churches, the St. Barbara's Church housed a warehouse during Soviet times. Later, it was used as an office building. By 1980, the Church was housing the Council of the Moscow Region Department of the All-Russian Society for the Conservation of Historical and Cultural Monuments. In 1991, the Church was handed back to the congregation.